SHORT & SWEET: Cupcake Tower for an 80th Birthday. Cupcake Tower for an 80th Birthday. Customer Peg wanted all things pink for her 80th birthday. The large gum paste rose sits on top of a small cake covered in buttercream. 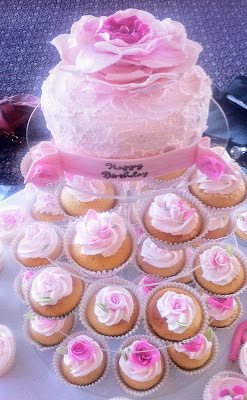 Each cupcake is covered with buttercream and fondant roses. The first tier rose buds and the mid tier a small pink rose and the bottom tier a fully open rose of a deep pink sprinkled with sparkle. All cupcakes in silver cases.